Posted on July 25, 2011 October 29, 2011 by Tarleisio	This entry was posted in Uncategorized and tagged frankincense, Juniper, Linda Pilkington, Orange Blossom, Ormonde Jayne, Tolu, tolu balsam. Bookmark the permalink. ← A Green and Searing Heart of Light – with a giveaway! Tolu is one of the OJ scents I have yet to try. You've described it beautifully. Tolu is one of my favourites. It is a warm cashmere scent, but I also have taken it on a Caribbean vacation and loved it there too. Muse, I'm so glad you liked my review! Ah, yes, the myrtle wreath – isn't that amazing? 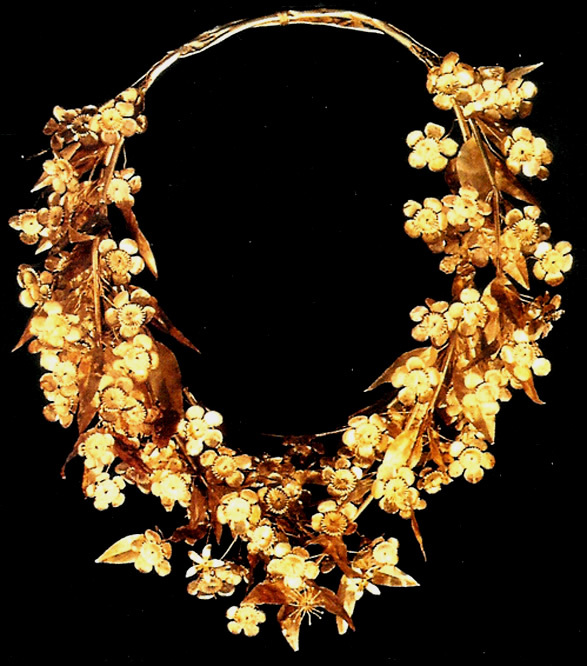 All wrought in 24K gold…and that's just one of the wreaths they found! At the risk of my neck – and maybe my reputation, LOL! – I think that if you like Orris Noir – and I know you do – then you might like Tolu! Krista – thank you! It's fast becoming one of my favorites, too! I can't wait to see what it will do in chilly weather, but I can imagine that the tropical warmth of the Carribean would make it bloom no less beautifully! Glad to see I'm not the only one who loves Tolu! And I do mean…LOVE….I really, truly need to get my hands on a bit, OK, a LOT more than a sample as soon as I can! Heavens, my comment disappeared completely! I wanted to say I love the analogy of the wreath and the perfume. I need to get more involved in the OJ line, one that I have not explored all that much so far. Flavour – you're so right! It takes a certain…confidence/attitude to wear an Ormonde Jayne, and I think that's a most excellent thing! Lucy – you should try them. They are all of them amazing – even the one I couldn't wear! There will be more OJ reviews to come, as I'm just getting started! As I keep saying, all OJ's scents, including masculine ones, work for me. I'm not ready to venture into buying 12 FBs but I will be gladly using all the samples I have for those perfumes for which I do not have either a decant or a travel set. As I was reading recently some mentioning of how much different people liked Tolu (great review, Tarleisio, I don't even wish I could write like you – I know that I never will) I kept trying it again and again. I like it. I never disliked it. But it's somewhere closer to the end of my imaginary ranking for this line in terms of personal preferences.